Get Dorothy's signature look instantly with this super deluxe braided Dorothy wig! Perfect with our Dorothy costumes, the authentic wig is made from fine, synthetic hair and is styled in Dorothy's signature look, including two braids with banana curls at the ends. The braids are tied off with a blue ribbon and the interior is lined with a lace wig cap. The cap is adjustable to ensure a proper and comfortable fit. Don't spend all night styling your hair! 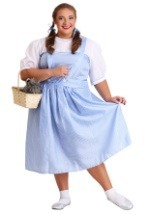 Slip this wig on with our Dorothy costumes and try on a pair of our Ruby shoes for a movie quality costume!